How many Christmas Markets are there in the world each holiday season? So far I visited 24 of them and I loved all the ones in Hamburg, Dresden and Berlin. I even jumped on a plane to Vienna and loved all of the ones over there. 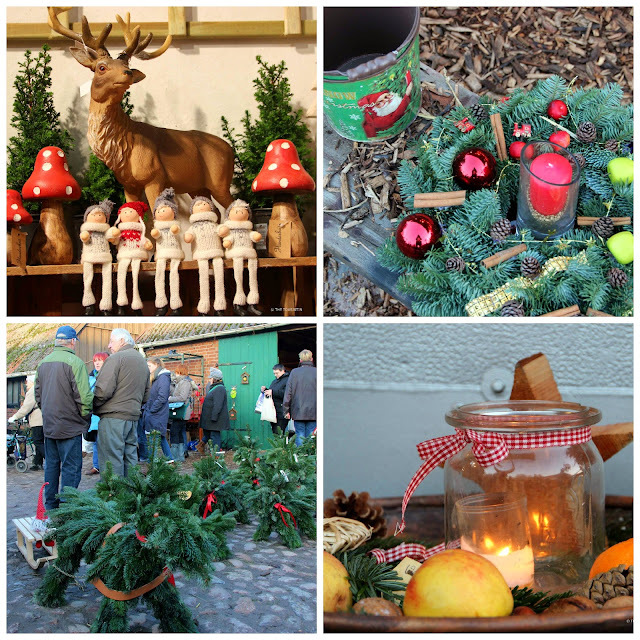 I am slowly becoming a Christmas Market expert, if there is such a thing. And now, I found the cutest Christmas Market in Germany. Would you like to know where it is? Imagine life in a village in the countryside in the early 1930’s, life still fells pretty much pre-industrial, no big machines and no tractors. There are only a few tiny grocery stores, a church and a school. Sheep are grazing the meadows, and the ducks own the pond. There are apple and pear orchards as far as the eye can see. Is there some movement on the horizon? Deers? At dusk children go to the barn to wish their donkey sweet dreams. After dinner and just before bed time it is all about stories by candlelight. There is lots of quiet and peace, life is charming. Everybody often day dreams of a more simplified life closer to nature, right? I found it in the northern most state of Germany in Schleswig-Holstein. Basthorst is a village with 400 citizens in the district of Lauenburg. There is this big estate, with an impressive red brick manor house erected in 1750, several hundreds of year old barns around a court plus many different outhouses. As dreamed of there are meadows with sheep, and there is also a pond, and yes, also ducks. Every Holiday Season the owners open their estate to the public and invite them over to visit their Christmas Market. While being at this idyllic place, remember that 20 minutes by car from here the iron curtain would have been. What a delight that the nearly 1,400 kilometre long border doesn't divide Germany any more. West and East. How must it have been in this part and on the other side in the GDR during these long 40 years? It meant living suppressed by the SED dictatorship, versus living freely in the western part. Living conditions and ideologies imposed by politicians on these previous neighbours, could probably not have been more different from each other. It is December 2014 and albeit all this only ended 25 years ago, it seems utterly absurd. It somehow feels like someone created this story for a novel or feature film. At the same time it also is a miracle that the wall isn’t there anymore. Miracles still happen these days. Have you ever had traditional German food and mulled wine in a barn where the horses live? There isn’t a cosier experience one can have. Back outside, it is winter and after a short moment in the fresh air, it gets freezing cold, but the mulled wine comes in different varieties and quickly warms visitors. Mingle merrily around a huge bonfire or browse the more than 250 stalls in the barns and outhouses for selected handcrafted products and clothes in country style. No matter what, this is a very special Christmas market and very unlike any others. Due to its location and venue the atmosphere is magical and I declare this officially Christmas Market heaven. Address: Gut Basthorst. Auf dem Gut 3. 21493 Basthorst. Germany. Opening hrs: On weekends of the 1st, 2nd, 3rd, 4th Advent, Fr -Sun 11 - to 7pm. Entrance fee: EUR 4.50, it is free for children up to the age of 16. What do you think? I believe you might love this Christmas Market too, right? Looking forward to hear from you. Hi Askan, thanks for your comment. The one in Siegburg looks lovely as well.